Is it safe to buy auto insurance online ? It seems like every time you turn on the television, you encounter a commercial that asks whether you’re paying too much for your car insurance. Chances are your insurer won’t be champing at the bit to tell you the answer, so the burden is on you to find out. But with an internet connection and a little planning, you can do it on your lunch hour. Whether you’re shopping for your first policy or looking for a better rate, buying auto insurance online online is a gateway to a world of auto insurance quotes and information about the companies that issue them. As you’ll see, low cost is just one factor to consider. 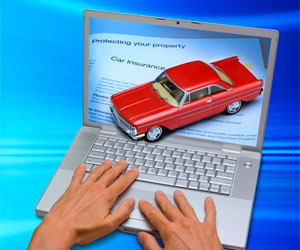 Let’s take a look at five tips to keep in mind when you go online for buying auto insurance. – uninsured / underinsured motorist coverage. Check with your state’s insurance department to find out which types of coverage drivers are legally required to carry and which types are optional. While there is a seemingly endless number of companies issuing auto insurance policies these days, there are really just two ways to buy auto insurance : you can purchase a policy, in person through an agent, a licensed individual who sells policies on behalf of one or more insurance companies, or you can buy directly from an insurer via web site or telephone. Buying auto insurance online still accounts for a relatively small portion of total auto insurance sales, but it’s increasing in popularity. According to a 2011 survey by the internet marketing research company Comscore, just 20 percent of new auto insurance policies were purchased online, compared to 43 percent purchased from an agent. However, the number of online purchases represents an increase of 5 percent from just two years earlier, while the number of agent purchases represents a 6 percent decline. Additionally, a 2011 survey by J.D. Power and associates showed that 54 percent of new auto insurance owners applied for a rate quote online, the first time this has happened for a majority of respondents (source : Insurance information institute). Whether you shop for car insurance online or go one of the other routes, make sure you come prepared with all of the information you need to get an accurate quote. Take stock of your car’s make, model, year, vehicle identification number ( VIN ), the zip code of where you park the car at night and any aftermarket safety or anti theft accessories installed on the car. Get the license numbers of every driver to be insured under the policy, as well as the date when they were first licensed, and obtain a copy of your driving record. Get an updated credit score as well, your credit rating can affect your auto insurance premiums, since some insurers say those with poor credit scores are more likely to file claims. There are a few steps you can take to get lower insurance premiums, as well. Tally up the number of miles you drove this year versus the previous year, a significant decrease in the mileage you drive might help you get a lower quote. Consider completing a defensive driving course online, insuring multiple vehicles (or your home) through the same insurance company or looking for a plan with a higher deductible. You might even want to eliminate certain types of insurance not required by law in your state, you could forego collision and comprehensive coverage on very old cars, for instance (source: Insurance information institute). How to buy auto insurance ? Get at least three different price quotes from different insurers, you might even consider calling the insurance company or meeting with an agent in addition to searching online. You should take a look at your auto insurance policy every year to find out how much you’re paying in premiums and how much coverage you’re getting in return. The cost of the same policy can vary widely between companies based on factors like how much the company spends on advertising, commissions paid to the agent and the risk levels of the company’s pool of insured drivers. To start comparing quotes, try logging on to an auto insurance aggregator web site, where visitors submit information about their car and driving history in exchange for an array of quotes from different insurance companies. Typically, many of the quotes come via follow up emails and phone calls from insurance agents. You can also try searching web sites for companies, which sell insurance directly to consumers and provide quotes immediately. Auto insurance is regulated on a state by state basis, and your state’s insurance department usually has a bunch of relevant information to your search in the consumer information section of its web site. Search the National association of insurance commissioners state web map to find a link to your state insurance department (source : NAIC). The depth of information varies, but these web sites often include profiles of the different insurance companies licensed within the state, sample price comparisons charged by competing agencies to cover common vehicles, and consumer guides to auto insurance. Many insurance departments also provide complaint indexes, which tally the number of consumer complaints upheld against a particular company versus the number of policies they have issued. This information can be valuable in determining which company to sign with. If you’re unsure if a prospective insurer is licensed within your state, ask an agent. If the company falsely claims to be licensed in your state, report them. Just because a company offers you a cheap quote doesn’t mean you should let it insure your vehicle. Take a close look at the terms of your policy to ensure it matches your last auto insurance policy, and that you’re getting an equivalent amount of coverage (or at least the minimum amount required by law in your state). Examine the terms of the agreement to make sure the company don’t require the use of cheaper aftermarket materials for repairs instead of the original factory parts, which can pose safety hazards (source : Consumer reports). You should also make sure that your insurance company is financially stable before purchasing your policy. In addition to checking with your state insurance department, ratings organizations are good resources to determine a company’s financial state. And look to your friends and family for recommendations, as well.